DESIGNED with “fitted for but not with” concept, new generation patrol vessel (NGPV) KD Pahang can be promptly upgraded with additional combat equipment and systems according to different missions or warfare conditions. PSC- Naval Dockyard (PSC-ND) head of project management Al-Syafiq Abdul Wahid said the concept enabled the vessel to equip itself with relevant combat machinery and system according to different war situations. “It is similar to the ‘plug and play’concept where we can install the vessel with the relevant hardware like surface-to-surface missile system, the Exocet MM40 and anti-aircraft missile system, the SEARAM. “It will only take 24 hours to fix the hardware. This is because SEARAM fitting does not involve any extensive module projection from the deck. “It only needs a perched missile launcher on the deck. “But currently the vessel is only equipped with 76mm gun at the front and 30mm gun at the back,” he said. 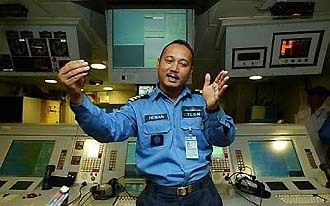 Heman in the KD Pahang’s Combat Information Centre which is the heart of the vessel. As a naval architect that had been overseeing the shipbuilding project from scrap, Al-Syafiq said the heart of the vessel was actually in the Combat Information Centre (CIC). “The CIC room the system can automatically detect, identify, decide and destroy enemy in surface or air warfare without human intervention. “With the three dimensional radar, the ship can detect a target up to 80km. “In case of any attack to the vessel, the decoy system will confuse the enemy that could have locked the ship as a target. “The decoy system can also redirect any missile targeting the ship by releasing a bloom. “The bloom will create confusion by producing the attracting factor such as heat that directs the missile towards it and not the vessel,” he said. KD Pahang RMN Commander Heman Buang said the vessel’s overall ship management system was at par with international standard patrol vessel. “The ship’s control and monitoring system (SCAMS) can monitor, operate and troubleshoot the ship’s propulsion system, stability, turning, machineries, damage control, flood prevention and fire fighting from the machinery control system room. “The SCAMS also provides backups if the system experiences any difficulties which is very rare,” he said. At the bridge, he said the vessel was equipped with electronic navigational chart display, SCAMS, electronic throttle and steering controls, auto pilot system, public address system and electronic radar. 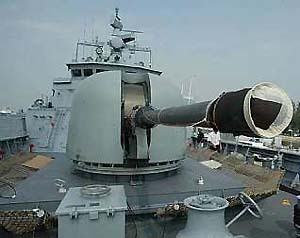 The KD Pahang is equipped with 76mm gun. In terms of size, he said that the 91m long, 12.5m wide, 3.4m shaft and five-deck NGPV was approximately twice the size and length of the previous patrol vessels which were handed over to the Malaysian Maritime Enforcement Agency. “Owing to size, vessel can fit in two Bravo or Seahawk helicopters on our deck which is equipped with a landing system that lock and slide the aircraft for stability. “One of the aircrafts can also be securely slide in our hanger which is more secure. “In general, the NGPV makes our role in combat, monitoring and search and rescue mission more efficient,” he said. In terms of speed, Heman pointed out that the two units of Caterpillar engines could carry the vessel up to more than 22 knots. “For maximising operation distance up to 6000 nautical miles, the vessel is advised to sail at 12 knots,” he said. He said the structure of KD Pahang too supported a more comfortable working condition for its 68 crew. “The cabins are more spacious, each with attached shower room and toilets. “Furthermore, the lower bunk beds can be folded into a sofa for the crew’s convenience. “As a commander, I am really looking forward to operate this NGPV soon as it is the most advanced patrol vessel that I have ever been on,” he said. KD Pahang will join KD Kedah to patrol around Malaysian waters soon.